First, take a look at the above link. There's score, 7 tetriminos, slowly growing difficulty - standard things for a Tetris game. The catch? There isn't a single line of code. Nor a single variable. 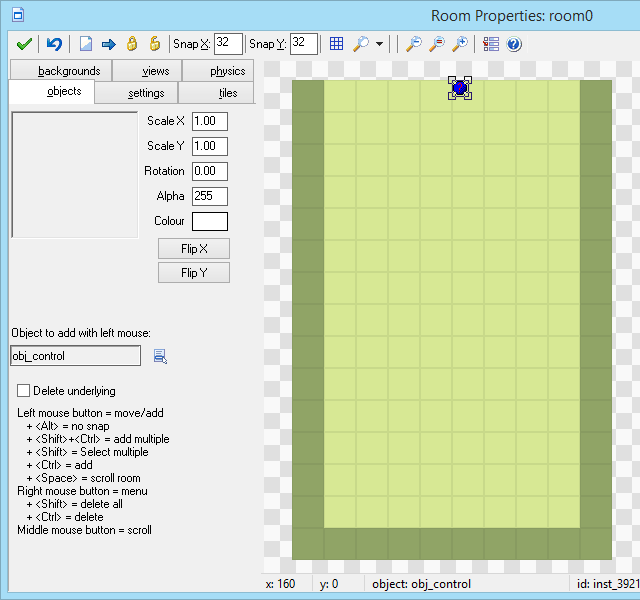 It's all done in GameMaker's "drag & drop" visual scripting. Difficulty depends not only on developer's coding skills, but also on the tools used. For example, making a "space invaders" game in most modern tools with built-in memory management, collisions, and function sets is easy enough, but should you go lower level... storing invader information in an array? Storing and moving around dynamically created player and invader bullets?? Programming trajectories and destructible defenses??? Not as much careless fun as you may have envisioned. Pong may seem suddenly simpler with base requirements of just a bunch of variables and inverting ball x/y velocity for bounces. Additionally, certain tools are best suited for certain task. For example, it is easy to make a turn-based puzzle game in PuzzleScript (hence the name) due to the way engine is based on "rule" definitions. Making a platformer game in PuzzleScript, however, is a much harder feat. It isn't, by no means, impossible, but requires more planning than it would take with a "platformer-centric" engine. Game development isn't just about having the right tools/resources/experience, but also actually using them creatively. As such, programming in general is often about finding an approach to the problem that isn't the most blatantly obvious or expected but produces results more efficient in terms of computer of development time. 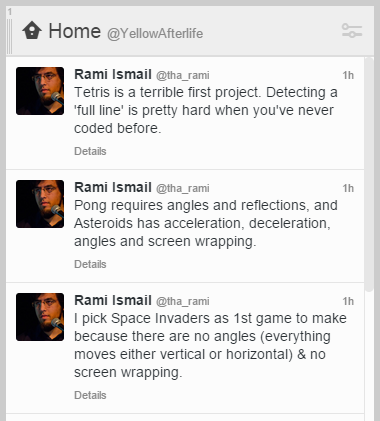 To not make it all look like a rant or a opinion piece, the rest of this post is about creative use of tools - particularly, making the aforementioned Tetris in GameMaker without a single line of code or variable. Store the field as a 2-dimensional array. If tools used do not support 2d arrays, store the field as a [cols * rows] long 1d array and prepare to face potential uncaught "index wrap" problems later on. Store the falling block as a similar (except smaller) 2d array. With the classic variant of tetris that's a 4x4 array. You can also call it a "matrix" instead of "array" if that makes you feel cooler. Rotate the falling block by rotating the contents of the according array (more or less means circularly swapping the array cell values around). Also ensure that player cannot rotate a block in such way that it would get stuck in the wall or outer field edge. Calculate collisions between the falling block and field blocks by testing two arrays for overlaps. Note that X/Y "iterator" indexes have to be restricted accordingly to avoid misbehaviour when the falling block is close to the map edge (thus it's array bounds exceed beyond the edge by one or two blocks). Line clearing is done by checking if all cells are filled in any given row. If that is so, shift the contents of all rows above the filled line downwards (overwriting it), and add score bonus accordingly. Indeed, that doesn't sound too simple. At least not to someone new to programming. So the question is - how to make the process not that? 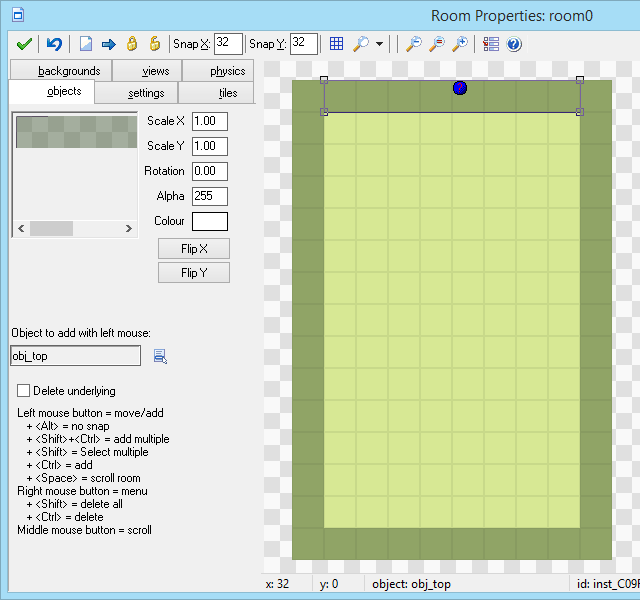 Since this blog isn't all about using increasingly more antique versions of software, this tutorial is intended for use with GameMaker: Studio. A separate editable project file (GMK) for versions 8.0/8.1 is available in the end of this post, but uses slightly different approaches to warrant consistent looks. With Tetris being a game about stacking blocks in a field, you logically need to represent the blocks and the field somehow. Arrays are relatively complicated. What is not complicated, however, is GameMaker's "objects". The mask is not needed just yet, but it will later save us from having to tweak collision mask settings of some other graphics. The next step would be to set up a room that the game is going to be taking place in. 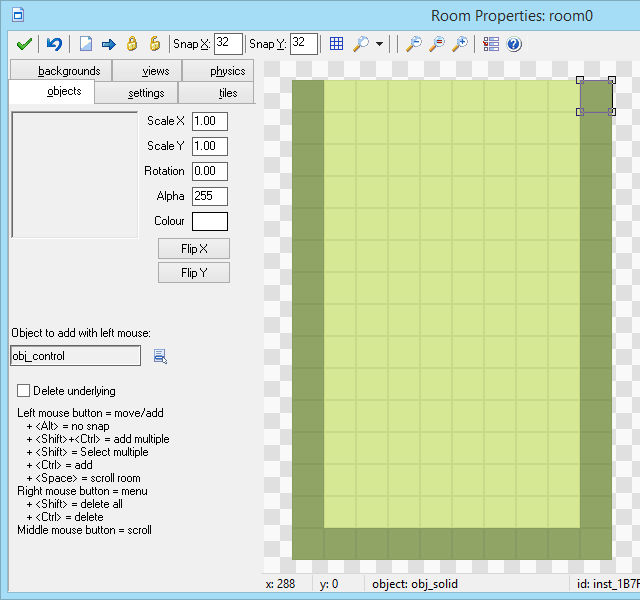 Here I'm going to make a 320x480 room, which with 32x32 blocks converts into a 8x14 field for the actual game. The next important part of the game is falling blocks. Note, that, since the blocks are going to be rotatable later on, the sprite origin/centre point is to be set, in this case to the centre of the image (x32 y32). With these intact the standard set of tetriminos is complete, and sprite origins will ensure that piece rotations will comply with Super Rotation System of Tetris Guidelines (although this example in general will not comply with TG in due to non-standard field size and simplified feature set). Also note that you will need to tick "Precise collision checking" checkbox in each of these sprites, or they will default to rectangular bounding boxes, which are not quite what you want for these. For the falling pieces to be actually "falling", they need to move vertically. As you can see, in the "Create" event the alarm is set to trigger for the first time in a moment after creation, and then, whenever it triggers, the piece moves 32 pixels downwards and the alarm is reset to 12 frames (which is 0.4 seconds on 30 FPS0. Of course, it is also possible to introduce continuous movement in a direction while a button is held by using alarms or variables, but such exercise is left to the reader. As previously mentioned, normally the piece rotation could be quite a bit of a trouble. The logic used is dead simple - rotate the piece; if the piece is now stuck in a wall, rotate it to the original state. It is also worth mentioning that the "Transform Sprite" action misses quite an opportunity to have "relative" flag apply to the angle specified. Another approach that you can take with this is creating separate graphics for each rotation and changing them accordingly (this is what is used in GM8 version of the example to avoid visual artefacts, by the way), but importing and linking 24 pieces of graphics to the game logic is not something that you should be doing with your life, if possible. Now that the pieces are made, and a fair chunk of their logic is in place, it would be reasoned to actually implement a mechanism for their selection and creation. GameMaker has two D&D actions for creating instances of object - the "Create Instance", which creates an instance of specified object, and the "Create Random", which creates an instance of one of up to four types picking randomly. Noticeably, neither of two alone is not sufficient to fit all 7 piece types. Additionally, two piece types have their centres-of-mass set at block intersections, while the other five have them set at block centers, meaning that they have to be created at different offsets and thus two actions are not sufficient either. So, first we try to create a T-block with a chance of 1/7. If that fails (leaving us with 6/7 chance), we check for 1/3 chance and create either a I-block or a square block if it's satisfied (2/4 * 1/3 * 6/7 = 1/7 chance each). If that fails as well (leaving us with 4/7 chance), we create a L-block, a J-block, or either of "snake" blocks, granting 1/7 chance for each. As you can see, the previously created blocks now reside in a "location below the block is free to move in" condition, and otherwise it schedules obj_control to drop the next piece in half of second and destroys the piece. If running the game now, it can be noted that pieces appear, fall, and can be accordingly controlled, but simply disappear when they hit the floor, as that is what exactly the event does at the moment. Now, to the interesting part. What happens after a piece lands? It needs to converted into separate blocks on stage. And that can be a bit of a challenge. The most obvious thing to do would be to simply "hardcode" creation of 4 blocks into each piece. Which admittedly kind of works (and is used in GM8 version of example) but that's about a hundred extra "Create Object" actions (4 for square piece and then 4 actions for each of 4 rotations of each of 6 other pieces) to be put in into the pieces, and, let's face it, it's no fun to spend a number of minutes putting in coordinates and checking if you have made no mistakes while doing that. When it is created, it sweeps over each cell in the 8x14 field by moving horizontally while in the row, and then moving back and down as the row ends (similar to a common typewriter mechanism). For each of it's positions it checks whether it is overlapping with the falling piece, and creates a block at it's position if that is so. Once it's work is done, it simply self-destructs, as there is no other purpose for it. Running the game would reveal that now the pieces nicely land onto the stage, and it generally seems like an almost complete game! Except for few details, of course. And move down what was above it. Nothing of that is particularly scary, but, not to end up with one messy object, let's make each step a separate object type - in order, obj_check_field, obj_check_row, obj_destructor, and obj_gravity. Since the functions of these are going to be chained, it's recommended that you create and name 4 blank object to avoid having to return and edit actions later. Now there are only a few things left to do. Upon impact it creates the "game over" overlay, resets obj_control's alarm 0 (to prevent it from creating additional falling pieces), and self-destructs to prevent creating additional "game over" overlays. Score is to be awarded when the player clears a line. Additionally, in the classic case score awarded depends on lines cleared at once and the game level (which we don't have here). So the simplest method to approach this here is going to be to simply add 4 conditions (for each of 4 possible cases) with score being changed accordingly. Here I've used 100pts for 1 line, 300 for 2 lines, 500 for 3 lines, and 800 for 4 lines cleared at once. Which translates to an expression being 20 * power(0.995, score / 200), which we can put in instead of the constant pace in obj_fall's alarm event. One could argue that the use of a function is "cheating" around the Drag and Drop system, but GameMaker does not have a "power/exponent" operator and thus there's no better way of doing this. 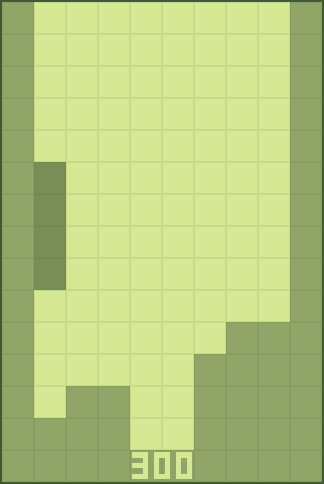 And so that's how you make a Tetris entirely in GameMaker's Drag & Drop. Update: just in case you were wondering, yes, of course you can also apply the same principles to do the same thing in GML - here's a GMZ. Code is largely a direct translation but with printer and line checking objects removed in favor of adding equivalent code into obj_fall's alarm 0 (as I bet that you understand the concept of loops if you know GML). I’ve run into an issue with this tetris version: on occasion after I complete a line or set of lines some blocks that “stick out” will fall more than they should and I can’t seem to pinpoint exactly how to replicate the issue, although it does happen fairly often. I am using the GML version of the file, although I tested with the drag and drop version as well and the error is there as well. Any ideas on how to fix? Hi! Sorry for my late reply; I never got notified of your response. Here’s a link to a screenshot of the game where the glitch would occur. Here, after I dropped the line piece, the top green square on the rightmost column would fall all the way down to the bottom of the field (instead of just by 16 pixels, which would be expected.) This seems to occur whenever I have a situation where a single block is hovering over a large hole, regardless of the piece it is or the piece I used last. Sorry for the reply to my own thread, but I think that it would be helpful for me to understand the purpose and uses of the “_x, _y” and “cx, cy” variables used in “obj_fall”‘s “do work” event; I’ve been studying it for a while now and I can’t seem to figure out how they’re used. Sorry again. I was able to get the glitch to happen and recorded it happening. The blue shape that gets created has a piece that sticks out, and you can see the part that sticks out fall more than it should and get disconnected from the other blue blocks. This isn’t unique to only blue blocks; this happens regardless of the type of piece. The link to the HTML5 version is broken, just letting you know. Depends on what it’s for – if you want that over each appearing block, you could simply create the smaller blocks in obj_block’ create event at relative position. Hi I wonder what part of code trigger creating new instance after previous instance lands on either obj_solid or other instance of objects(obj_Tb,obj_Lb….)? obj_control’s Alarm 0 event creates new pieces. It’s set in obj_fall’s Alarm 0 (“Piece Physics: Landing”) if it detects a block underneath. Im having trouble with the sprites. all i need is to know what the size of the sprites are. A single “block” is 32×32, as the post says. You can right-click the images in the post, save them, and load them into GameMaker: Studio for ease of use (also see notes on sprite origins). I’ve provided a downloadable example separately to save people from going through this manually unless they want to. 14 here; Ignore bad stuff. Thats goshdarn amazing. I recently myself accomplished a (much less great) feat of creating pong by adjusting the directions manually, which is hella annoying. I also had a long discussion with a friend, some time last year about how DnD and GML are functionally the same; Which he disagreed with. What do you think of DnD? Internally they are pretty much the same – all DnD blocks are converted into function calls upon compilation. You can see the list of these as “action_” functions when doing “Scripts – Show built-in functions”. If you own the HTML5 export for GameMaker: Studio, you can also compile the game in debug mode and inspect the JS code generated from GML and DnD – gives an impression how some things work internally. So DnD is quite alright, but in the long run it is better to use GML, as it covers more elements of the language and can be used to shape the program structure better.